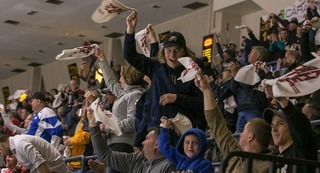 Saginaw, Michigan – The Saginaw Spirit took on the Guelph Storm on Saturday for United Way Night. The Spirit were looking to get back on track, coming into the game losing two straight. Saginaw started the first period strong, Nico Daws made big saves early in his first start of the year. Philadelphia Flyers prospect Isaac Radcliffe gave the Storm the lead midway through the period. Cedric Ralph gave Guelph a two goal lead less than two minutes later off a two-on-one rush. Guelph added two powerplay goals by Alexey Toropchenko and Ralph getting his second of the game. Saginaw was outshot 10-5 in the first period and trailed 4-0. Guelph added a goal in the second Mason Primeau, who is the son of former NHL player Wayne Primeau. Saginaw broke onto the scoresheet with a goal by Nicholas Porco. 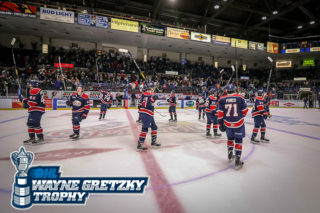 Porco was set up with a back door pass from Islanders prospect Blade Jenkins at 15:56 of the period With the secondary assist, Reagan O’Grady got his first point as a Saginaw Spirit after being acquired from the Steelheads. Less than two minutes later, Cole Coskey added a goal to cut the Guelph lead to three. Blade Jenkins set up Coskey’s one-timer for his second assist of the game. Saginaw would carry the momentum into the third period. Islanders 2018 second round pick Bode Wilde scored his first OHL goal on the powerplay to bring the Spirit within two. With 4:27 left in the third, Coskey added a powerplay goal for his second of the game. Bode Wilde and Spirit leading scorer Albert Michnac assisted on the play. San Jose Sharks first round pick Ryan Merkley had the puck on his stick in the dying seconds of the game, but turned it over on a clearing attempt to Cole Coksey. 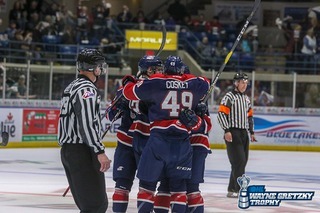 Coskey tapped the puck in front to Red Wings prospect Brady Gilmour, completing the comeback with just eight seconds left in the third period to force overtime. Despite the five goal regulation comeback, Cedric Ralph completed his hat trick at 3:35 of overtime on a two-on-one rush with Liam Hawel. 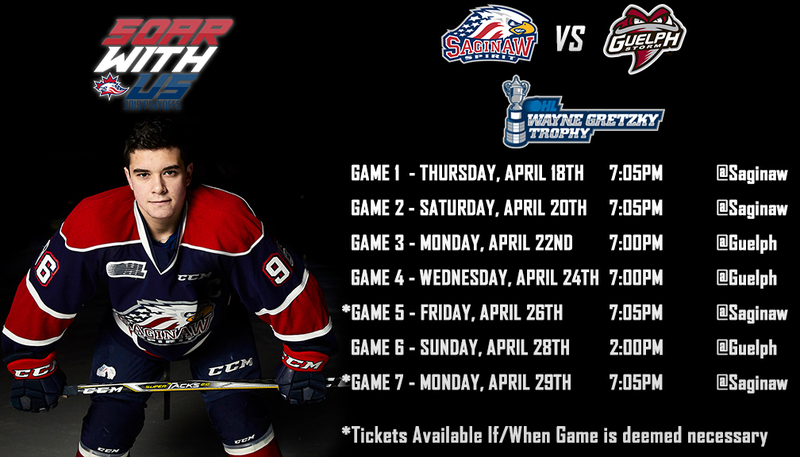 Saginaw travels to Flint on Wednesday to take on the Firebirds. 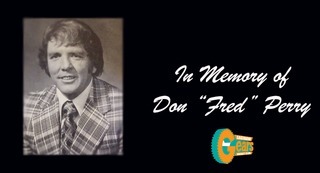 Listen to the Spirit on FM Talk & Sports 100.5 and www.fmtalk1005.com beginning at 6:50 p.m. The next home game for the Spirit is Saturday, October 13, when the North Bay Battalion come to The Dow. 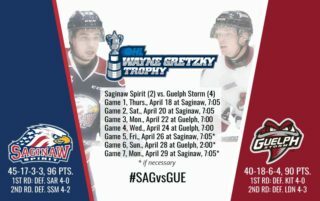 For tickets, call (989) 497-7747, visit saginawspirit.com, or visit the Saginaw Spirit Store at 5789 State Street, Saginaw, MI.